According to a 9th century Congo legend, placing a glass bottle in a tree outside the home would capture any evil spirit lurking nearby. Occassionally, the entombed spirit could be heard howling from inside the bottle. In the morning, the sun's rays would destroy the spirit, thereby protecting the home. Legend is so much more fun than reality! 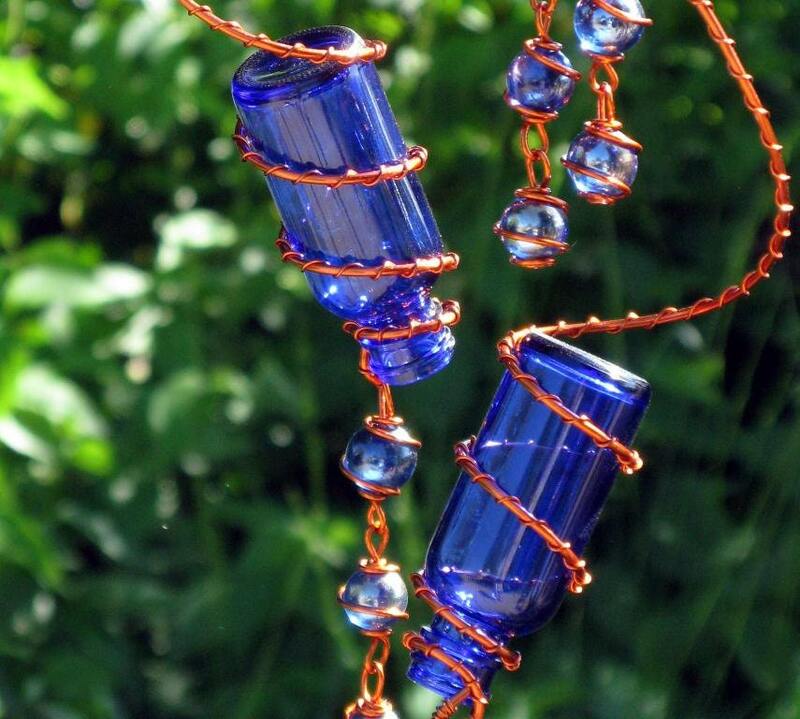 I have wrapped these two little spirit bottles with solid copper enamel coated wire (to slow oxidation) and accented them with shimmering iridescent blue glass marbles just to make sure that the bottles are irresistible to those evil spirits. They are each topped with a copper hook and ready to be hung in the tree of your choice. These are absolutely exquisite!!! I love them. Even the business card was adorable. I can’t wait to hang these from my porch.